Sometimes even the Flash needs to bring along some crime-fighting gadgets! This Flash Built Backpack features an internal carry capacity large enough for a padded 15-inches laptop pocket, 2 main pockets and 2 expandable side pockets. With reflective binding trims, a casted metal logo with reflective inlay, and a wipe clean surface, you'll look super with this bag on hand. 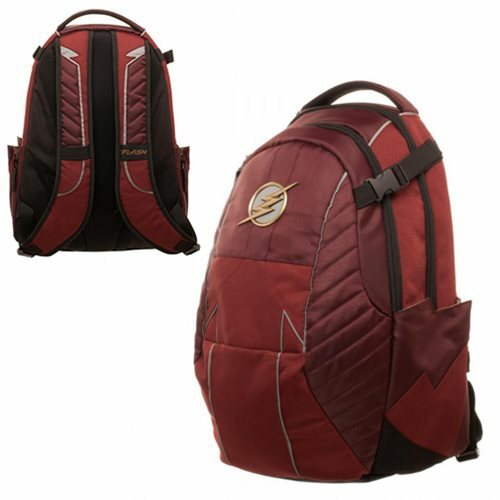 The Flash Built Backpack is made of polyester and measures approximately 18 1/2-inches tall x 11 1/2-inches wide x 9-inches long. Ages 14 and up.